Goldstein & Russell, P.C. is a small firm with a unique focus on practice before the United States Supreme Court. Over the past ten years, its members have provided high-quality representation to clients in scores of cases at every stage of the Supreme Court process. The firm now regularly is counsel or co-counsel to clients in one out of every ten cases that the Court hears on the merits, often in association with the Harvard Supreme Court Litigation Clinic founded and run by the firm's partners. Although the firm principally practices in the Supreme Court, it also represents clients in a small number of important matters in the federal courts of appeals. Goldstein & Russell, P.C., is the descendant of Goldstein & Howe, P.C., which Tom Goldstein founded (as Thomas C. Goldstein, P.C.) in 1999; Amy Howe joined the firm shortly thereafter. In 2005, Kevin Russell joined the firm from the U.S. Department of Justice. The following year, Tom left to establish the Supreme Court practice at Akin, Gump, Strauss, Hauer & Feld, LLP. Amy and Kevin re-formed the firm Tom left behind, creating Howe & Russell, P.C., which focused in significant part on the clinic programs at Stanford and Harvard. In January 2011, Tom returned to the firm, adding counsel Tejinder Singh, also formerly of Akin Gump. Amy subsequently left the firm to become the Editor of SCOTUSblog. In 2013, Eric Citron joined the firm after completing a clerkship at the Supreme Court for Justices Sandra Day O'Connor and Elena Kagan. In 2017 Sarah Harrington joined the firm after finishing an eight-year run as an Assistant to the Solicitor General at the United States Department of Justice. In 2004, Tom co-founded the Stanford Supreme Court Litigation Clinic with Stanford Professor Pam Karlan. Amy Howe and Kevin Russell subsequently became clinic instructors as well, along with Jeffrey Fisher on the Stanford faculty. 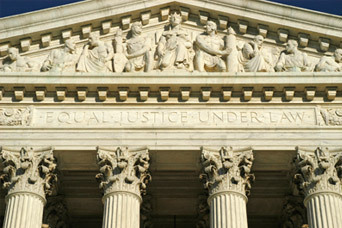 The firm continued its partnership with Stanford through 2013, during which time the clinic represented clients in over 50 merits cases at the Supreme Court. In 2005, the firm also began running a Supreme Court litigation clinic at Harvard during that school’s January winter term. The firm continues to run the clinic each January, working with students to provide pro bono representation to individuals and organizations at the Court. The firm does hire a small number of summer associates. Applications should be directed to Tom Goldstein.